Kalichabad lies on the river Gumti south east of Jaunpur, and was incorporated into the civil station of the town in the 19th century. 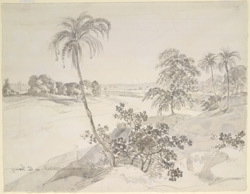 The view shows the river with a distant tomb. The nearby city of Jaunpur on the river Gumti was the capital of an independent sultanate ruled by the Sharqi dynasty from 1397 and an important centre of provincial Islamic architectural style. The city was sacked by Sikander Shah Lodi in the final decade of the fifteenth century when all major buildings, save the city's mosques, were destroyed by the zealous invader. The city was later taken by the Mughal emperor Akbar (r. 1556-1605). In the Journal that the young William Daniell kept we read on 26 November 1789, "Arrived at Jaunpore at 6 am dist. from Benares 18 Koass. Breakfasted in the patilla Boat that was sent from Benares some days ago & which arrived at Jaunpore Yesterday - Abt 9 o C. set out & visited the Fort, Mosques, & other buildings of note."